In the Cheviot Hills neighborhood, Cheviot Knolls and Tract 10440 are entirely within Rancho Ballona. Castle Heights , Cheviot Hills , Monte Mar Vista , California Country Club Estates , and smaller tracts are within the Rancho Rincón de los Bueyes. Only Country Club Highlands occupies parts of both ranchos; Manning Avenue is, for the most part, the dividing line between them. The Spanish Crown granted Rancho Rincón de los Bueyes in what was then New Spain ; the Mexican government granted Rancho La Ballona after the area became Alta California . "Initial Spanish exploration of the Los Angeles area occurred in 1542, but sustained contact with the Tongva came only after Mission San Gabriel Arcángel was constructed in 1771. This marked the beginning of an era of forced relocation and exposure to Old World diseases, leading to the rapid collapse of the Tongva population. At times the Tongva violently resisted Spanish rule, such as the 1785 rebellion led by the female chief Toypurina. In 1821, Mexico gained its independence from Spain and the government sold mission lands to ranchers, forcing the Tongva to culturally assimilate. Three decades later, California was ceded to the United States following the Mexican-American War. The US government signed treaties with the Tongva, promising 8.5 million acres (3,400,000 ha) of land for reservations, but these treaties were never ratified. By the turn of the 20th century, the Island Tongva had disappeared and the mainland communities were also nearing extinction." 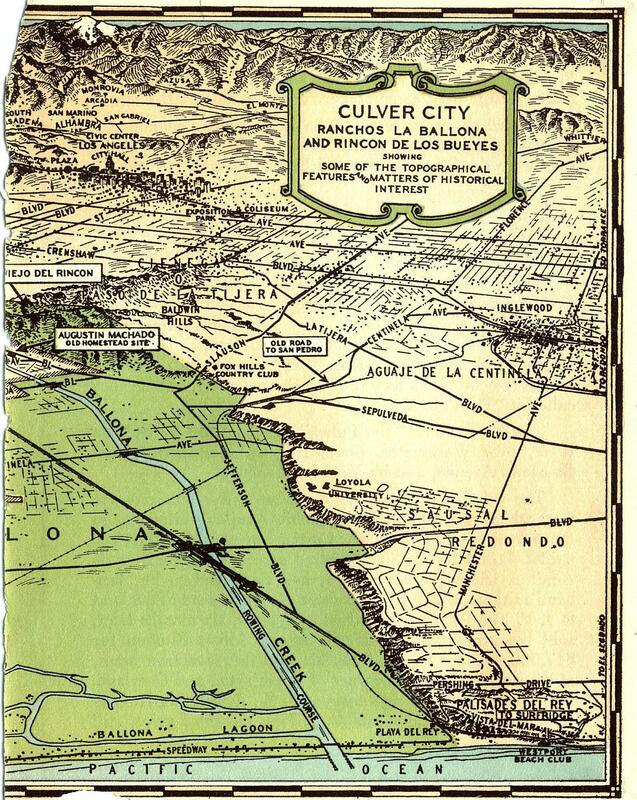 Los Angeles itself was not a rancho, but a pueblo. The apocryphal story of its founding is that, on September 4, 1781, 11 men, 11 women, and 22 children left Mission San Gabriel, accompanied by the governor of Alta California, Felipe de Neve (1727-1784), soldiers, mission priests, and a few Native Americans a to settle a site along the Los Angeles River. With a speech by Governor de Neve, a blessing and prayers from the mission fathers, El Pueblo de Nuestra Senora la Reina de los Angeles de Porciuncula (The Town of Our Lady the Queen of the Angeles of Porciuncula) was established. The truth is a bit more complicated, and it is well told by Nathan Masters in Happy Birthday, Los Angeles! But is the Story of the City's Founding a Myth? Official 1888 Los Angeles County Map by V. J. (Valentine James) Rowen shows ranchos. "In October of 1852 the families owning La Ballona and El Rincón filed their claims with the Commission which had been established the year before to settle all land claims. "The Machados and Talamantes had smooth sailing. The Board gave them its approval on February 14, 1854, and the United States District Court upheld the decision on appeal. "The Higueras were not so lucky. They were turned down at first. Not until the end of 1869 was their claim upheld in the District Court. "When the United States finally issued its patent covering Rancho La Ballona, on December 8, 1873, it confirmed the title to nearly 14,000 acres. The patentees were the original four claimants. 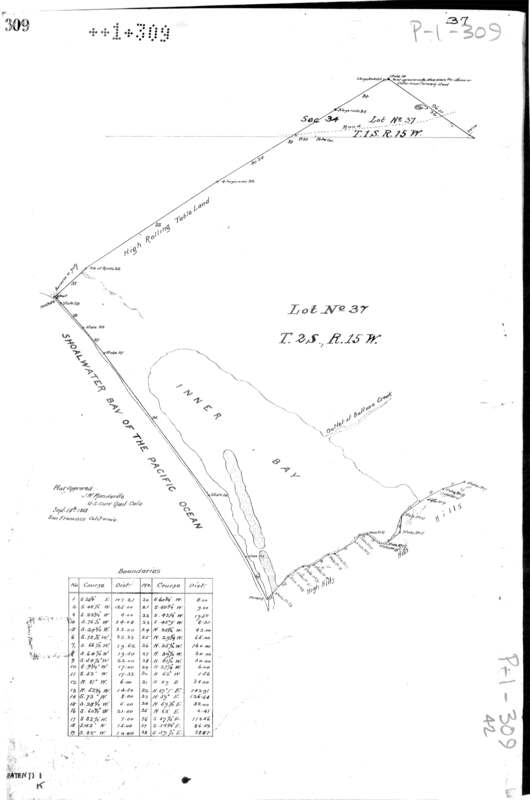 The patent covering Rancho Rincón de los Bueyes, issued on August 27, 1872, confirmed title to 3100 acres, the patentees being Francisco and Secundino Higuera." (From W. W. Robinson, "Culver City, California: A Calendar of Events: in which is Included, Also, the Story of Palms and Playa Del Rey Together with Rancho La Ballona and Rancho Rincón de los Bueyes (Title Guarantee and Trust Company, 1941)." On December 5, 1821, Bernardo Higuera (1790–1837) and Cornelio Lopez (b. 1792) petitioned military commander José de la Guerra y Noriega (1779-1858) to grant them Rancho Rincón de los Bueyes. Bernardo’s father, Joaquin Higuera, had been alcalde (mayor and chief judicial official) of the Pueblo in 1800. Bernardo Higuera and Cornelio Lopez, citizens of the Pueblo de Nuestra Señora la Reina de Los Angeles, and under the command of our honor, with the greatest respect and submission before your Excellency, appear and say that, possessing at the present time a number of cattle and not having any place so as properly to be able to keep them with a grazing ground of sufficient extent . . . . Therefore ask and beseech your extreme clemency to be pleased to grant to them the tract within this vicinity called Corral Viejo del Rincon so as that they may be able to place a corral for herding the said cattle unless it does some injury to the neighboring residents — a favor they expect from your extreme goodness and for which they will recognize themselves very grateful. May God preserve you many years. (From Romance of a Rancho , The Beverly Hills Citizen, Volume XVII – No. 2, June 23, 1939, pages 9, 12, which credits Prexcedes Arnaz de Lavigne, W. W. Robinson, and Nellie Van de Grift Sanchez, whose translation of a document by Don Jose de Arnaz appeared in “Touring Topics” in 1928.) In 1843, Spain's grant of the 3,127-acre Rancho Rincón de los Bueyes to Higuera and Lopez was confirmed by Mexican Governor Manuel Micheltorena. 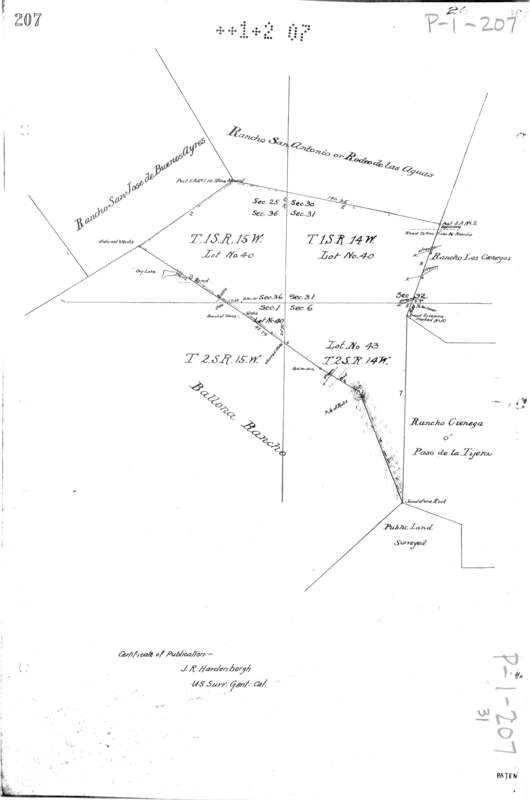 In March 1871, this "Plat of the Rancho Rincon de los Bueyes" was "Finally Confirmed to Francisco Higuera et al." The United States General Land Office, approved it on August 22, 1872. Rancho Rincón de Los Bueyes from official 1888 Los Angeles County map overlaying modern Google Earth map. 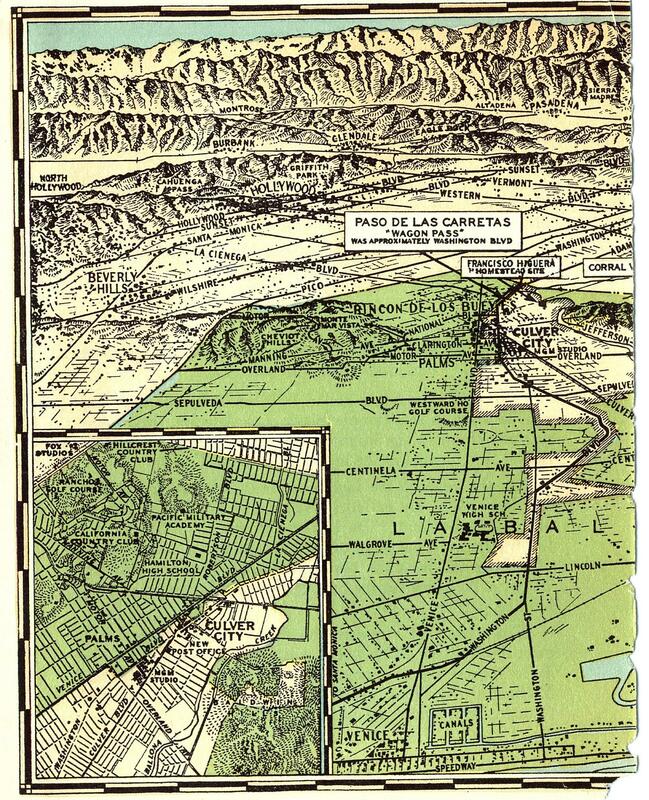 The rancho's northern limits are (starting from the northwest corner) Pico Boulevard (separating it from Rancho San Jose de Buenos Ayres ) and Airdrome Street on the northeast (dividing it from Rancho Rodeo de los Aguas ). To the east (heading south) Genesee Avenue then Fairfax Avenue divide it from Rancho Las Cienegas , then La Cienega Boulevard marks (roughly, since the road curves) the edge of Rancho Cienega o Paso de la Tiejera . Moving north from the southern tip, the border with Rancho La Ballona (along the west) follows a line to the top of the Baldwin Park Scenic Overlook stairs (marked on Arnaz' 1875 survey as "6 Pile of Rocks") from which point the limit line veers westerly in a straight line to the intersection of Overland Avenue and Pico Boulevard – running between Culver City's Ince Boulevard and Van Buren Place, then following Faris Drive and Manning Avenue (until Manning turns north by Ashby Avenue). (From W. W. Robinson, Culver City, California: A Calendar of Events: in which is Included, Also, the Story of Palms and Playa Del Rey Together with Rancho La Ballona and Rancho Rincón de los Bueyes (Title Guarantee and Trust Company, 1941). 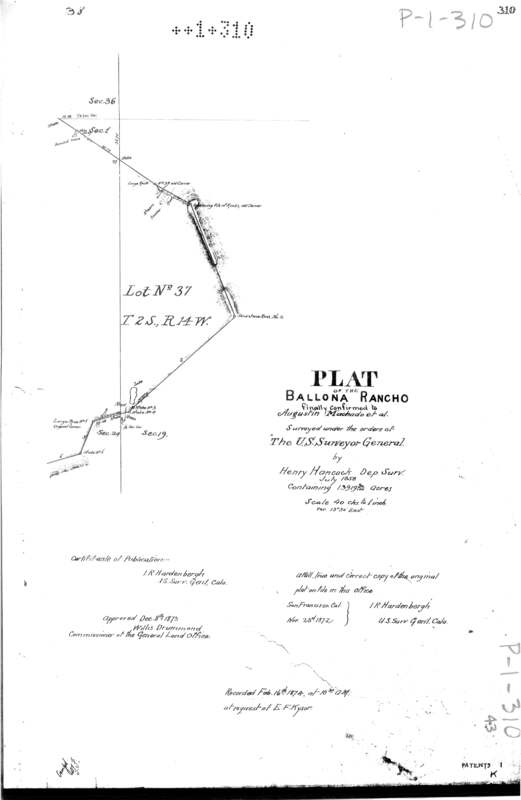 On December 8, 1873, the U.S. Government "finally confirmed" this "Plat of the Ballona Rancho" to Agustín Machado (1794-1865).